It's pretty safe to say at this point that amiibo has definitely proven to have been a profitable venture for Nintendo. While it may be that some figures are extremely difficult to find in stores, it cannot be understated that demand has been high all across the board; especially considering that, with new games being released each month that support amiibo, they become more appealing and useful as time passes. During Nintendo's recent financial results briefing, amiibo was unsurprisingly a key topic and the results were very satisfying. For starters, Nintendo has shipped 10.5 million units around the world, with 5.7 million of those being before the end of 2014. What this means is that amiibo has not been a "flash in the pan" and that the concept has staying power even outside of the holiday season. 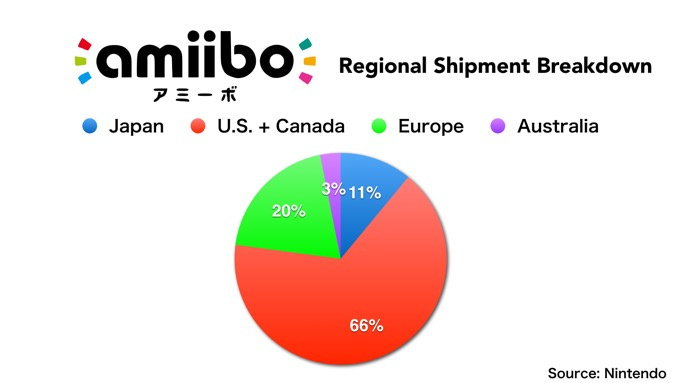 Interestingly enough, a staggering 66 percent of amiibo sales have been in the U.S. and Canada, with Europe coming in second at 20 percent, Japan at 11 percent, and Australia at 3 percent. On the omnipresent problem of stock shortages, Iwata-san reinforced that Nintendo is doing all that it can to keep supply up. Factors being considered for which amiibo will receive prioritized production are how quickly the amiibo sold out, how integral it is to a particular game, and how high demand for it has been among retailers and consumers. No time frame was given for when things will actually start to get better, but at least the issue is being addressed. In regards to the future of amiibo, Iwata had plenty to say. He brought up the special Yoshi's Wooly World amiibo, which will actually be made out of yarn. Also, the card-based amiibo, which will be used with the upcoming Animal Crossing spinoff, Animal Crossing: Happy Home Designer, on the 3DS. Lastly, Iwata mentioned the NFC adapter for the old Nintendo 3DS, so those who haven't yet upgraded can enjoy their amiibo with their portable. No release dates to windows were given on any of these, hopefully more information will be released soon. We launched a new product category – amiibo – simultaneously with "Super Smash Bros for Wii U," and the end of the subject fiscal term marked a total shipment of approximately 10.5 million units worldwide. As we had shipped approximately 5.7 million units by the end of calendar year 2014, it is safe to say that we achieved very strong growth even in the period immediately after the year-end sales season was over. Our assessment is that people purchase additional amiibo figures without any seasonal bias, as they are relatively more affordable than video game titles. Our consumers have been inconvenienced by stock shortages on some of the figures in our amiibo lineup. We have increased production for amiibo figures that have sold out very quickly after launch, that are indispensable to play a certain game and for which we have received strong demand from retailers and consumers. However, we are very sorry that we can't promise at what point we will likely be able to resolve the current situation because figures such as these require a considerable amount of time to produce, store shelf space is limited and it is difficult to precisely predict the exact amount of overall demand. On the other hand, the number of software titles compatible with amiibo is increasing and consumers' recognition and understanding for amiibo has improved significantly compared to the launch period, so we believe that we can predict further sales growth. What do you make of all this? What would you like to see out of amiibo in the future? Share your thoughts in the comments below. Less shortages and more compatibility with either Wii U or 3DS games would be nice. i have 10 amiibos and and only an old 3ds xl. i dont buy them to use with games. i think its great to finally have official nintendo characters available to buy and will continue to get them just to have. You do know this is not an invention of Nintendo and most likely hinders to false idol-ism and worshiping of false deities. Back in the funcoland days an woman brought her sons PlayStation in to trade in. It literally looked like if their devil worshiping going on with the PSX. It was covered with the anti-Christ Star, and all kinds of weird markings. The mother was kinda embarrassed about the sacrilegious markings on the PSX unit. @RegalSin Just... WHAT THE F*** MAN?! These are just toys. If you don't like figures and/or games you are really in the wrong neighborhood. Good news for Nintendo, they are coming back. This is going to be a great year for them. More amiibos would be nice. I bet he is fun at parties. What about the amiibo: amiibo? Like the "amiibo" logo as an amiibo? I think they are counting a lot of South American countries along with the U.S. + Canada percentage. There are a lot of Nintendo fans around here, I have 5 friends who've gotten all of the amiibo that have been launched so far (in the region, at least). @RegalSin And just out of curiosity. You do know your image comes from "No Face" that is a character from "Spirited Away". Based on Japanese Folklore, to you using such an image should probably be seen as paganism. @Captain_Toad To be fair, I still don't see how it's been this successful. I can easily see the appeal from a collectable perspective, but there has yet to be a game that has convinced me why these are essential. I guess the point is that they are really not essential. Nintendo sold them thinking they wouldn't sell that much because of that. But people like to collect toys and action figures. In the end there will be some wanting to collect because of the gaming uses and completionism, and others will want to play with them because they already want to collect them anyway. Some don't care for one of the reasons. Anyway with the collection guys they got a new public that might not even have a game or console compatible, and don't care. We use to have plenty here in Europe but with the high demand from US, EU consumers are now buying them all to sell on eBay. Amazon sells out fast within minutes. I have to rely on GameStop to preorder the moment preorders goes live to secure one so I won't have to pay more than 15€ each. @MitchVogel I agree there hasn't been a game that makes them 'essential' but I do think it's difficult to deny they've been a sales success. If 10.5m isn't successful, what is? 65% of the amiibo shipped to NA is Mario. 1% everyone else. They really need to make a more premium Amiibo, maybe they could joint with other figure-maker to make one. Something like Nendoroid Amiibo, or Figma Amiibo... that's cash printing in there Nintendo. Yoshi Wooly World is a nice start, but I hope more of this unique Amiibo is coming. @MitchVogel ah ok, in that case I totally agree!! I guess to be essential in a game it's either a specific mode or extra content, which makes them DLC. But then you have the cost of the figure AND the content to cover so in that respect I find it difficult to see that they will be good value extras. Considering there's only a few hundred people in Austalia, 3% is pretty good. I've bought 3 so far and that's because there's been a good range available in stores and I impulse bought em. I'd not have bothered if I had to hunt em down or order online. Wow that many in the US and still so hard to find one? We need more in Australia and Europe! "store shelf space is limited"
I have a ton of these. I live in L.A. & and they are very hard to find. I have to resort to importing them from Amazon France, asking my sister in Australia to grab me some or go the unfortunate EBay route. I use them in smash, hyrule warriors, MK, and Toad'S Treasure Tracker. They spice up the games and are simply fun to collect. @MitchVogel If it's a surprised contest the PS4 definitely takes the cake. It's called "rare and desired", okay? Rare. And Desired. amiibo FTW. woot. How did this whole thing get framed as a "supply shortage" anyway? I don't get that. I'm probably the only person that doesn't care about amiibos and think they're stupid. I think Nintendo should get their retailers to get the job done right. I only manage to get the first wave pre-ordered in Europe. No luck with any of the next ones, amiibo are hard to find from the source original retailers but very easy to find and buy from ebay for 2 or 3 times their original price which tells the whole story already. I want a Nintendo Direct in the sense that they sell their products directly to me. They should do a new club Nintendo that they will make their products available first to us (end consumers) and give us priority for special and limited editions. I'll wait for them to give Amiibo cards instead because its affordable. 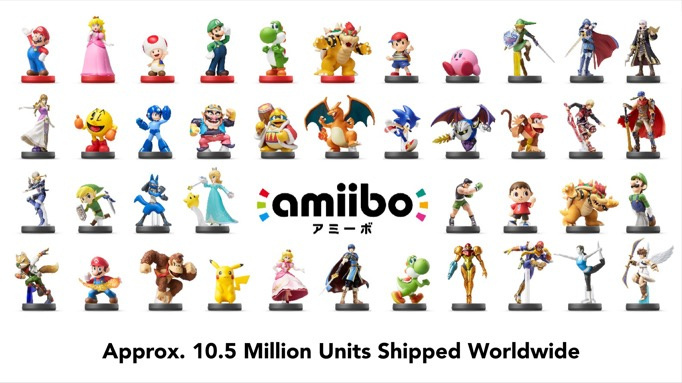 Taking into consideration how small of a time frame amiibo have been around, these numbers are pretty impressive! I expected that to be the first comment, actually. Still, good to see Nintendo is working hard on it. Kind of ironic that the place that get the most amiibo shipped is the one that also buy imports from other countries (and complains a lot). Well any toy that can get a long line of grown ups waiting in the cold for over 5 hour is a success to me. I have 4 amiibos, but I wish to own a lot more. But living in Brazil is awful to buy anything, I'm paying almost 45,00 for each Amiibo. I don't think they can yet predict future demand because they NEVER did meet current demand so that still don't know how high current demand is. Wait a minute! Is that sales demand or where they've shipped them to? Because obviously they can't be sold unless they've been shipped to a region. At any rate, starting to feel less sorry that the cover plate 3DS is not available in the US - they'd have the purchasing power to rip the plates from our hands too. @Frank90 Many Amiibo are only available in the UK from scapling gits on Ebay for about £40-45 so cost everywhere is high for Amiibo and it's not even Nintendo getting the profits. Im impressed theyve SHIPPED that many amiibo, not surprised US got such a large % as there are so many stores to ship them to - Best Buy, Walmart, Kmart, Sears, Target, Toys R Us, Gamestop. Not just a lot of store chains but actual buildings these need to be in. America is one large strip mall w/ a few larger malls filling in the gaps. And Ive been in stores w/ literally walls of Princess Peach, so SHIPPED is certainly not sold, not for Mario, Peach, Zelda and Luigi. Glad Im not collecting these. Amazing that the US gets the most, but has had the biggest problems with stock and availability. I wonder how many of those shipped are the unpurchased Marios and Peaches that we are all tired of seeing at stores everywhere. We need more please Nintendo. Well at least restocks are on the way. I'm going to hold off with the hopes that I can find a Ike and Marth in stores one day. 66% in Canada and usa is amazing! No wonder I don't have much trouble finding them lol (well, some are hard to find). I bought my first two amiibo a couple days ago, a super smash bros mario, and a toon link! I definitely plan to buy more, next ones being the splatoon 3 pack with splatoon. If like myself you own a Wii U and 3ds surely it would be possible to link my gamepad and 3ds so I can scan amiibo that way, of course then Nintendo won't make money out of the reader accessory. With new Fire Emblem games coming to Wii U and 3ds surely there will be a whole set of FE amiibo on the way! Impressive sales, but I'm still not all that interested, and in fact, I feel like I'm being a little bit ripped off when I can't access all the content in games like MK8 and Captain Toad (for example) without amiibo. I don't have the dedication (or money) to track down and buy all these things, as I'd much rather have games. I've already got bucket loads of Nintendo figures. Still, this is good news for Nintendo and I hope it helps them get back to where they need to be. The store shelf space problem and unknown demand can be solved really easily. Just directly sell them from Nintendo directly and ship them to customers. They can better gauge demand and negate the shelf space problem. Since I'm lazy, it would be cool for NintendonLife to do a comparison between Skylanders, Infinity and Amiibo - see where they all stand, how many each sold in its first year, etc. Alot of people were actually saying the same thing before launch; serious concerns about them being fancy physical versions of on disc DLC/day one DLC was the primary criticism against them (which turned out to be true, made even worse by the fact many of them aren't even available for purchase unlike their competitors). They're essentially really nice looking official figurines at a pretty cheap price. Although I don't believe that excuses Nintendo making silly decisions like only sending a handful of certain amiibo to stores and not restocking more. Universal issues with pre-orders not being fulfilled, common amiibo differing depending on where one lives and Nintendo giving really awful and in many cases vague PR responses as to whether or not certain amiibo are being restocked are all pointing to stock issues or purposely understocking certain amiibo to make it seem like they're "rare". Absolutely no one should be having to jump through this many hoops for these mass produced toys. And yet we suffer the worst of the stock issues while NOA twiddles their thumbs and Japan gets reprints of many "rare" amiibo shipped out already. Our complaints are valid until Nintendo actually stops giving us the short end of the stick and restocks the darn things already. @RegalSin what? What's this got to do with anything? They are toys!